The small window for enactment of a major U.S. immigration overhaul during 2014 seems to have closed. Dormant in the months after Senate passage of a sweeping immigration reform bill in June 2013 that was immediately met with a cold shoulder in the House, immigration reform got a fresh lease on life at the end of January when House Republican leaders outlined their set of immigration principles. Optimism that release of those principles heralded a political and legislative breakthrough proved short-lived, however. Less than a week after the principles were issued at House Republicans’ annual retreat, House Speaker John Boehner (R-OH) pronounced legislative action unlikely, citing lack of trust in the Obama administration. "There's widespread doubt about whether this administration can be trusted to enforce our laws, and it's going to be difficult to move any immigration legislation until that changes,” he said. Days earlier, Senate Minority Leader Mitch McConnell said he saw an “irresolvable conflict” as a result of differences between the House and Senate over the scope of reform. “I don’t see how you get to an outcome this year with the two bodies in such a different place,” the Kentucky Republican said. Speaker Boehner publicly insists he still wants to get immigration done, and aides report that work is continuing behind the scenes. Some have even predicted another change of course later this year. However, by most accounts, the complex political challenges that the Republican Party would face by tackling immigration in 2014 may be insurmountable. The much-awaited House GOP principles released January 30 call for verifiable improvements to border security and interior enforcement, a fully functioning entry-exit system to track visa overstayers, and a legal immigration system more aligned with U.S. economic needs. In a step seen by many as remarkable, the document also addresses the estimated 11 million unauthorized immigrants living in the United States—the issue that has proved most controversial in Republican circles. Lost in the analysis of Republicans’ decision not to proceed with immigration reform was the fact that the statement of principles, put forth by GOP leadership and supported by many rank-and-file House Republicans, represents a significant acknowledgment that legal status must be extended to unauthorized immigrants. The document endorses a pathway to citizenship for “DREAMers”—certain unauthorized immigrants who entered the country as children and who attain a college degree or serve in the military. And the principles would allow the broader unauthorized population to live in the United States “legally without fear,” after getting right with the law, paying fines and back taxes, and learning English. In the days before the release of the principles, immigration reform supporters awaited the document with guarded optimism. President Obama struck a marked conciliatory tone on immigration in his State of the Union address, foregoing criticism of House Republicans for their inaction. Once the GOP standards were unveiled, the President signaled openness to concede a long-time White House demand: an independent pathway to citizenship for the unauthorized. The Republicans’ principles, though lacking in details, also received soft-pedal praise from congressional Democrats and immigration advocates. But the reaction to the immigration principles—clearly a trial balloon floated by GOP leadership—was swift and unequivocal. Within three days, many leading Republicans had pulled back. Asked on February 2 whether he thought legislation could clear Congress this year, Rep. Paul Ryan, a prominent GOP supporter of immigration reform, stated: “That is clearly in doubt." Republican lawmakers have cited two main reasons for the party’s decision to hit the brakes this year: lack of support among House Republicans and inability to resolve differences between the Senate’s comprehensive approach and the House’s insistence on a step-by-step strategy. Emerging from the House GOP retreat, where immigration proved a significant topic of discussion, Rep. Raul Labrador of Idaho said about two-thirds of members did not want to move forward on the issue, with half opposed to immigration reform on principle, and the other half supportive of action but not at this time. For the GOP, the immigration issue cuts two ways: it is unpopular with base voters and in district politics, but crucial for the party’s long-term national fortunes. As memories of the 2012 presidential election (which saw minority and immigrant voters flock overwhelmingly to President Obama and other Democrats) have receded and the 2014 midterm elections gain center stage, the politics of House members’ districts now trump a national political calculus. As Republicans hope to recapture control of the Senate in 2014, even some big-picture GOP strategists are focused on near-term goals rather than the longer-range objective of winning back the White House in 2016. Thus, it has become decidedly more difficult for party leaders to argue that immigration must get done in 2014. In addition, Republican election strategists have hammered the point that tackling immigration this year would divert voters’ attention away from what Republicans see as their ultimate political weapon: continued focus on the Affordable Care Act (ACA), which is highly unpopular with conservatives. Leading conservative voices have publicly implored House leadership to abandon their immigration push in an election year, saying it would muddy the GOP’s narrative, complicate individual incumbents’ elections, and bring no political gain. Concern over a Latino electoral backlash if immigration reform is deferred is not a factor for Republicans in 2014. None of the competitive Senate races this year are in states with large Latino populations. In the House, a vast majority of GOP seats are in districts so conservative that there is virtually no risk of losing to Democrats. In these “safe” districts, immigration is not a popular issue, and many incumbents believe that supporting reform would only invite primary challengers. Moreover, of the 232 House seats held by Republicans, only 24 have a Latino population of 25 percent or higher. Of those, only four were carried by President Obama in 2012 and five more could potentially have a close general election. With an eye to the future, however, some Republicans, like Rep. Labrador, are making the case that immigration should be one of the party’s first priorities for 2015, with a new Congress that trends suggest will tilt markedly more Republican. If Republicans control both chambers next year, their party could tackle immigration on its own terms, enjoy more leverage in negotiations with the White House, and earn much of the credit. 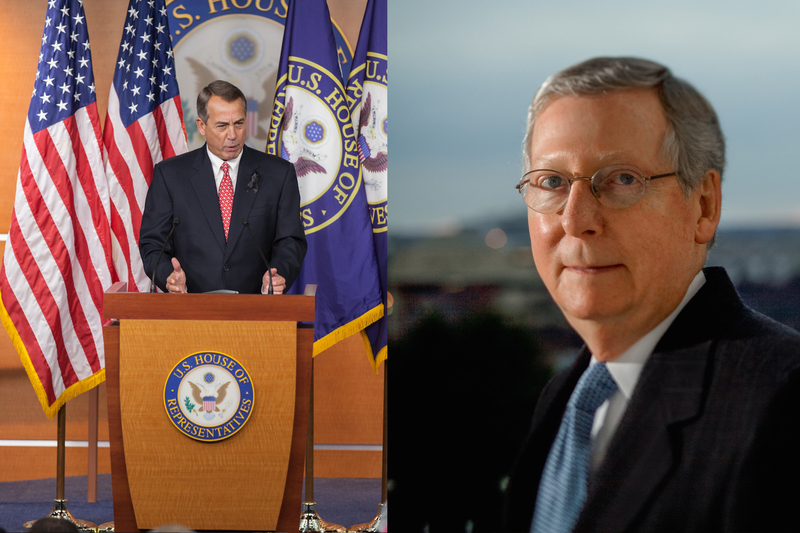 There are many indications that immigration reform is a priority for Speaker Boehner. He has made a variety of attempts to steer reform forward, but each time has ended up lacking his members’ support and backing away. After Senate passage of the Border Security, Economic Opportunity and Immigration Modernization Act (S. 744), the majority of Boehner’s conference opposed taking it up, with Tea Party conservatives being the nucleus of resistance. In a departure from 2013, the release of the GOP principles has displayed a new reality. Opposition to reform, at least this year, is no longer limited to Speaker Boehner’s conservative right flank, which he has ultimately chosen to disregard in recent important votes on the budget and the debt ceiling. On immigration, a broader swath of the conference came out against moving forward, including establishment Republicans and members who had played key roles in immigration negotiations last year. Similarly, the House leadership’s trial balloon has demonstrated that anti-reform lobbying efforts have expanded well beyond groups long focused on blocking reform to include high-profile, influential conservative organizations such as Heritage Action and FreedomWorks that are well funded and new to immigration activism. According to The New York Times, campaigns launched by these groups before the GOP retreat were so successful that by the time the principles were formally unveiled to members, their leadership already faced a losing battle. While the impasse created by these dynamics has disappointed supporters of immigration reform on the left and right, both parties are likely to exploit it for political gain. By blaming inaction on a perceived refusal by President Obama to enforce laws, Republicans will both avoid punishment and tap into an issue that mobilizes conservative voters. And while Democrats are concerned about losing leverage if the Senate changes hands, in the long term, they recognize that the failure of reform bodes well for their party in the 2016 elections. Even in 2014, to motivate base voters, congressional Democrats will point a finger at Republicans for their unwillingness to address an issue that has captured the attention of significant segments of the public, immigrant and native born alike. The debate surrounding House Republican leadership’s short-lived immigration initiative has several implications for when a new effort at legislation resumes. First, the Republican trial balloon surfaced some deep-seated tensions in the diverse coalition that was crucial to negotiating and passing the Senate bill. After President Obama and some immigrant-youth group leaders signaled openness to the House Republican standards, the AFL-CIO announced that it would withdraw support for immigration legislation if it did not include a path to citizenship for the unauthorized. The fracture served as a reminder that the coalition—made up of labor, faith, business, and law enforcement groups—represents a diverse set of interests and could quickly fall apart if lawmakers seek another opportunity to compromise. It also foreshadowed a looming debate for congressional Democrats over how hard they should hold out for an independent path to citizenship for the unauthorized. There is, however, a silver lining for immigration reform proponents in the Republicans’ failed trial balloon. According to Speaker Boehner and affirmed by other lawmakers, Republican House members “by and large” support the ideas expressed in the immigration principles, which include eligibility for citizenship for DREAMers and legal status without a special path to citizenship for other unauthorized immigrants. These shifts represent significant, new policy positions. Having staked out this political ground, the GOP may have begun paving the way for a compromise with Democrats when the timing is more politically advantageous for them. USCIS Announces New, Longer N-400. On February 4, United States Citizenship and Immigration Services (USCIS) announced that within 90 days, it will replace the current 10-page naturalization application form (called the N-400) with a longer (21-page) and more complex form. The revised form will contain additional questions about applicants’ links to terrorist groups, militias, prison, or military training, as well as acts of genocide. Some immigrant-rights groups are expressing concern that the new form could discourage eligible applicants from completing the naturalization process. According to Department of Homeland Security (DHS) officials, the changes were made to comply with the Intelligence Reform and Terrorism Prevention Act of 2004 and the 2007 Child Soldier Prevention Act; and to make the form more efficient and easier to process. DHS estimates that 8.8 million green-card holders are eligible for naturalization. E-Verify Participation Reaches Half-Million Milestone. More than 500,000 employers are now enrolled in E-Verify, the online system administered by USCIS that allows U.S. employers to verify the work eligibility status of new employees. E-Verify was established in 1996, and since 2001, participation has grown by more than 400 percent. In fiscal year (FY) 2013, employers queried E-Verify more than 25 million times, a record high. 63 Countries Selected for H-2A, H-2B Visa Programs. Beginning on January 28, 2014, nationals from 63 countries became eligible to participate in the H-2A and H-2B visa programs, which allow U.S. employers to hire foreign nationals to fill temporary agricultural and nonagricultural jobs, respectively. Austria, Italy, Panama, and Thailand were newly added to a list that already includes Argentina, Australia, Barbados, Belize, Brazil, Bulgaria, Canada, Chile, Costa Rica, Croatia, Dominican Republic, Ecuador, El Salvador, Estonia, Ethiopia, Fiji, Grenada, Guatemala, Haiti, Honduras, Hungary, Iceland, Ireland, Israel, Jamaica, Japan, Kiribati, Latvia, Lithuania, Macedonia, Mexico, Moldova, Montenegro, Nauru, the Netherlands, Nicaragua, New Zealand, Norway, Papua New Guinea, Peru, the Philippines, Poland, Romania, Samoa, Serbia, Slovakia, Slovenia, Solomon Islands, South Africa, South Korea, Spain, Switzerland, Tonga, Turkey, Tuvalu, Ukraine, United Kingdom, Uruguay, and Vanuatu. Federal Judge Rules on No-Fly List. On January 16, a federal judge for the U.S. District Court in San Francisco ruled in favor of a Malaysian national who was placed on the federal government’s “no-fly” list in 2004 and subsequently had her student visa revoked due to an FBI agent’s error. According to the ruling, the government violated her due process rights by placing her on the watch list and declining to provide a reason. The no-fly list was created after the September 11, 2001 terrorist attacks; as of 2012, it is reported to have 21,000 names, including 500 U.S. citizens. Placement on the no-fly list is the subject of several pending lawsuits. While national security officials have called it a key line of defense against terrorism, civil liberties groups have cited concerns of due process, profiling, false positives, and government secrecy. Border Apprehensions Increase in FY 2013. According to U.S. Customs and Border Protection (CBP), Border Patrol apprehensions in FY 2013 totaled 420,789 nationwide—414,397 of which occurred on the southwest border. FY 2013 apprehensions represent a 16 percent increase from the 364,768 apprehensions recorded in FY 2012, and a 42 percent drop from the 723,825 apprehensions in FY 2008. Apprehensions of Mexican nationals in FY 2013 remained relatively stable from the previous year, but apprehensions of individuals from countries other than Mexico (OTMs)—predominantly Central America—increased by 55 percent. With a new peak of 154,453 arrests, the Rio Grande Valley sector for the first time in recent history saw the highest number of apprehensions border-wide. DHS, Department of State Ease Asylum Restriction. On February 5, the Obama administration relaxed a rule barring admission to refugees and asylum seekers who have provided material support to terrorist groups in the past. Under the rule change published in the Federal Register, certain applicants who say they provided “insignificant” material support—such as small sums of money, meals, medical assistance, commercial interactions, or support under significant pressure—will no longer be automatically denied eligibility. The rule change will affect an estimated 3,000 pending asylum cases and an unknown number of individuals in removal proceedings. The immigrant-rights community lauded the rule change, saying it will help deserving applicants who pose no threat to national security. Critics say it is another example of presidential abuse of power, and it will allow those who have helped terrorist groups game the system. New Reports Reveal Detainer, Prosecutorial Discretion Trends. According to a new report by the Transactional Records Access Clearinghouse (TRAC), monthly average U.S. Immigration and Customs Enforcement (ICE) detainers fell by 23 percent from 2012 to 2013, and for fiscal years 2012 and 2013 combined, numbered roughly half a million. The report identified significant variation in nationwide detainer trends by state, ICE area of responsibility, gender, and nationality. Detainers are DHS requests made to law enforcement agencies to hold detained noncitizens so that ICE can take them into custody. A second report showed that in the first quarter of FY 2014, of all closed immigration court cases, only 7 percent (2,993) were the result of the exercise of prosecutorial discretion. While up from 4.7 percent when the prosecutorial discretion initiative began in 2012, these resolutions accounted for 8.5 percent of all case closures in FY 2013. Prosecutorial discretion, which seeks to defer prosecution of low-priority cases on a case-by-case basis and was announced by President Obama in 2012, began as a review of the immigration courts backlog, but is now applied to the incoming workload. Justin Bieber Arrest Spurs Larger Immigration Debate. The worlds of immigration law and celebrity gossip briefly converged in late January amidst speculation that the arrest of Canadian-born pop singer Justin Bieber might lead to his deportation. Miami Beach police arrested Bieber on January 23 for driving under the influence, resisting arrest, and driving without a valid license. Most immigration experts agree that even convictions for these offenses would not lead to the revocation of Bieber’s O-1 visa (granted to noncitizens of “extraordinary ability”). But the case ignited a national debate over the types of offenses that make someone deportable, especially as some commentators asserted that the immigration outcome of Mr. Bieber’s case would have been far less rosy if he had been less known or less influential. In another sign of the case’s impact, a petition on the White House website requesting Mr. Bieber’s deportation garnered more than 258,000 signatures. Pursuant to White House policy, that level of interest should prompt an official response. Federal Judge Orders Arizona to Turn Over Documents. In January, a federal judge for the U.S. District Court for the District of Arizona ordered Arizona Governor Jan Brewer to surrender internal documents that led to her 2012 executive order denying driver’s licenses to Deferred Action for Childhood Arrivals (DACA) beneficiaries. While it is unclear what information the documents contain, the judge rejected claims that they were protected by executive privilege. The order resulted from an ongoing lawsuit, filed by civil-rights groups, claiming that Governor Brewer’s driver’s license policy—which she later expanded to all individuals who have been granted deferred action—is discriminatory. Faye Hipsman was a Policy Analyst and California Program Coordinator with MPI's U.S. Immigration Policy Program.